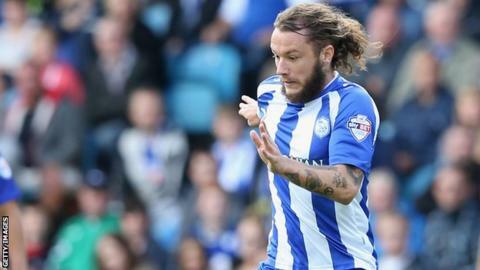 Stevie May's deflected free-kick gave Sheffield Wednesday victory over Reading at Hillsborough. The Scottish striker's goal on 83 minutes moved the Owls into the Championship play-off positions and gave Stuart Gray's side their first home win of the season. Reading's best chance came when they were awarded a first-half penalty. But goalkeeper Keiren Westwood made a crucial save with his legs to deny Reading striker Glenn Murray. The result ended Reading's run of four straight wins while Wednesday have now lost just once in their last 10 games. After a scrappy start, the game burst into life on 32 minutes when Murray, on loan from Crystal Palace, was brought down by midfielder Giles Coke. But the striker's effort down the middle was well saved by Westwood. The visitors had chances early in the second half but Jake Cooper's close-range header was met by Westwood and Murray's looping header hit the bar. Atdhe Nuhiu and May then went close with long-range efforts for Wednesday. Westwood was called into action again as he palmed away Nick Blackman's swerving 30-yard free-kick after 78 minutes. The home side then made the breakthrough with May scoring his third goal for the Owls since joining from St Johnstone in August. Wednesday were awarded a free-kick just outside the area and May's drilled effort took a deflection to wrong-foot league debutant Mikkel Andersen. The Owls threatened to add a second in the closing stages but the Reading defence hacked the ball clear following a goalmouth scramble and then Joe Mattock put a low shot straight at Andersen. Sheffield Wednesday manager Stuart Gray: "It's nice to put that one (their home form) to bed because people keep saying that we haven't won here since 26 March in the league. "I just felt that the penalty save was probably the defining moment in the game. It gave us a lift and it gave the fans a lift. We seemed to then pick up a bit of momentum. Reading manager Nigel Adkins: "I thought we did well in the first half and kept the crowd quiet. "Mikkel Andersen made his debut in goal because Feds (Adam Federici) was just feeling his calf. He had one shot on target to deal with and unfortunately it was deflected past him for the winner. Adkins on the Thai consortium takeover of the club: "I'm really excited about the future, the stability is now here because for a good 18 months I would suggest it hasn't been there. "Instead of having to sell players we might be able to bring some in." Match ends, Sheffield Wednesday 1, Reading 0. Second Half ends, Sheffield Wednesday 1, Reading 0. Attempt missed. Stevie May (Sheffield Wednesday) right footed shot from outside the box is too high. Assisted by Jeremy Helan. Attempt missed. Jamie Mackie (Reading) header from the centre of the box misses to the left. Assisted by Danny Guthrie with a cross following a set piece situation. Danny Guthrie (Reading) wins a free kick on the left wing. Corner, Reading. Conceded by Joe Mattock. Substitution, Sheffield Wednesday. Claude Dielna replaces Jacques Maghoma. Attempt missed. Hallam Hope (Sheffield Wednesday) right footed shot from very close range is too high. Assisted by Josè Semedo with a cross. Corner, Reading. Conceded by Hallam Hope. Attempt blocked. Jordan Obita (Reading) left footed shot from outside the box is blocked. Assisted by Danny Guthrie. Delay in match Tom Lees (Sheffield Wednesday) because of an injury. Substitution, Reading. Danny Guthrie replaces Hope Akpan. Attempt saved. Joe Mattock (Sheffield Wednesday) left footed shot from outside the box is saved in the centre of the goal. Assisted by Liam Palmer. Attempt blocked. Tom Lees (Sheffield Wednesday) header from the centre of the box is blocked. Assisted by Joe Mattock with a cross. Corner, Sheffield Wednesday. Conceded by Jordan Obita. Goal! Sheffield Wednesday 1, Reading 0. Stevie May (Sheffield Wednesday) from a free kick with a right footed shot to the bottom right corner. Jake Cooper (Reading) is shown the yellow card for hand ball. Hand ball by Jake Cooper (Reading). Attempt saved. Nick Blackman (Reading) left footed shot from outside the box is saved in the top left corner. Nick Blackman (Reading) wins a free kick in the attacking half. Substitution, Sheffield Wednesday. Jeremy Helan replaces Chris Maguire. Attempt missed. Chris Maguire (Sheffield Wednesday) left footed shot from outside the box misses to the right. Assisted by Stevie May. Substitution, Reading. Jamie Mackie replaces Simon Cox. Corner, Reading. Conceded by Glenn Loovens. Corner, Reading. Conceded by Tom Lees. Attempt blocked. Nick Blackman (Reading) left footed shot from the centre of the box is blocked. Foul by Hallam Hope (Sheffield Wednesday). Attempt missed. Stevie May (Sheffield Wednesday) right footed shot from outside the box is close, but misses to the left. Assisted by Atdhe Nuhiu. Substitution, Reading. Pavel Pogrebnyak replaces Glenn Murray. Attempt missed. Atdhe Nuhiu (Sheffield Wednesday) right footed shot from the centre of the box is close, but misses to the right. Assisted by Stevie May with a cross.